There is a lot of talk in our modern world about “rights.” Who has them, what kind, who doesn’t, why not, who needs them, animal rights, illegal alien rights, constitutional rights, parents rights, children’s rights, I can go on for pages! There is merit to some of the talk. I happen to agree with some of the statements made, and totally disagree with others. We won’t hash that all out today. Today I want to talk about the most important right that we have, as Christians. We have the right to become the children of God. Let’s take a look at that word that is thrown around so much. Right: a moral or legal entitlement to have or obtain something or to act in a certain way. We have the prerogative, the privilege, the advantage, authority, power, and permission to become the children of God. (Son means child in this case, male and female). It’s our birthright when we become children born of heaven, by the blood of Jesus. It’s not a done deal just because we said a prayer. 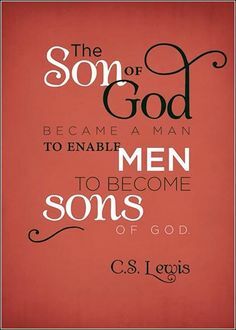 We get to “become” His son. How? By accepting His love for us, by knowing who He is, who we are in His eyes and heart, and by getting as close and intimate as possible with our Father. Lavished- that’s also a great word. It isn’t a small portion. It isn’t stingy. It is scandalous. It is a generous, extravagant amount. It is pouring an expensive, large amount of scented oil on the head of the One you love; it is cleaning His feet with your tears and drying them with your hair. It is a boat so filled with fish that it could sink. It is forgiveness in the face of an angry crowd ready to cast stones and with every right to do so. It is breaking the rules for love, healing on the Sabbath, eating with sinners, and getting intimate with lepers. God, the Father, has lavished His love on us. Why? Because He wants sons. Yes, He had one perfect Son, who obeyed in every way, even unto death, a Son that shares everything and has perfect relationship with the Father. But, He still wants us! Then once we acknowledge that we have the right to become His son, we step out in faith and let the transformation begin, we suddenly have all kinds of rights in the Kingdom, that no one can ever take away from us!